The Mastery Manual is packed with real-world ideas and practices that will get you to world-class quickly. The book comprises 36 life-changing modules, each of which will help you take your business and your life to the next level. Reflect on how you are working and living and commit to making course-corrections to get better. Think about what needs to happen during your day in order for you to feel you have lived fully and greatly. 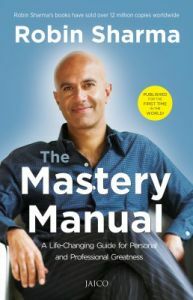 Robin Sharma reveals pithy yet profound thoughts that will revolutionize your way of living and make you master of your world. Robin Sharma is one of the most widely read authors in the world today. His eleven #l international bestsellers have sold millions of copies in over 60 countries and 70 languages. A highly influential blogger and social media celebrity, Robin is also a much sought-after speaker.